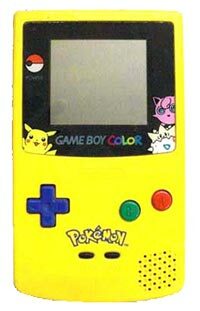 This is the hard to find Pokemon Game Boy Color system. The original Game Boy Color system plays all of your favorite Game Boy games as well as Game Boy Color games. I bought this gameboy rare one of course had a couple of scratches on the screen thought maybe you guys could change new screen or put a front light in there would of been cool but overall it runs good to ?? this one of a kind very happy with this product and very satisfied . The only bad thing that it doesn't come like a said it would come the back door was missing and button would work still 5 star . 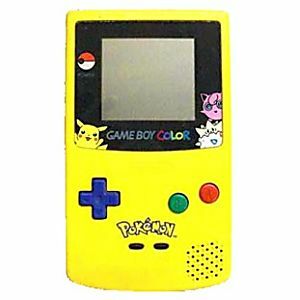 Hi i'm Patrick Moffatt and i am reviewing Pokemon Game Boy Color system and i am gonna review it right now so a Pokemon Game Boy Color System was the best game and it has a Pokemon hand-held system and includes 2 AA batteries and it good as new as you know the games like Pokemon Trading Card Game and Pokemon Pinball and i was very good at this game because i lkie it the game was very very hard and so i am Reviewing Pokemon Game Boy Color System Thank You. I'm so glad I own this special Pokemon Gameboy color, indeed it's one of the rarest GBC to own now. However, i was disappointed when i got this and found that the screen was not the pokemon screen so now i'm having a hard time finding the screen to put on it to make it all Pokemon looks. I'm still happy I got it tho, 5 stars.